Living In America (Sounds): I'm not familiar with the original, but it's a good start where Eläkeläiset introduce their typical polka trash. Hate Me (Children Of Bodom): An unusual idea to cover a black metal song, but it works. After a fast start, the song becomes more cabaret before coming to a macabre end. Nemo (Nightwish): They cover Finland's most popular band by replacing the opera parts with a circus atmosphere. And who doesn't prefer circus to opera? Idiot Walk (The Hives): The Hives' sound unfortunately isn't compatible with polka rhythms. Harmony In My Head (Buzzcocks): Eläkeläiset are far away from reflecting the harmony of the original. Like A Virgin (Madonna): I could never have thought that this Eighties classic has probably been written to an accordion. Can't Get You Out Of My Way (Kylie Minogue): A wonderful version that shouldn't be missed on any senior party. Saw It On TV (Kemopetrol): I don't know the original, but the integrated circus theme fits well the polka sound. 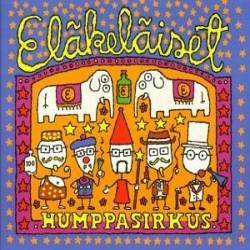 By The Grace Of God (Hellacopters): Eläkeläiset surprise with a real rock attitude. Party Hard (Andrew WK): If you've seen them already live, you understand that this title is perfect for Eläkeläiset. Word Up (Cameo): Eighties classics mostly work well for Eläkeläiset. Move It On Over (Hank Williams): I don't know the original, but the song works fine thanks to the humppa sound. Solitary Man (Neil Diamond): Another song I'm not familiar with, but it's sad and sentimental and unusual for Eläkeläiset. The result (12:2) isn't too bad for Eläkeläiset, even if the joke isn't so new anymore. But if you want to be more amused, look at the photos inside the booklet or buy their DVD. Another interesting information is the list of bands they were not allowed to cover, starting with Abba and ending with XTC.